The Forest of Compiègne is a peaceful place -- which makes coming across the Armistice Memorial something of a shock. 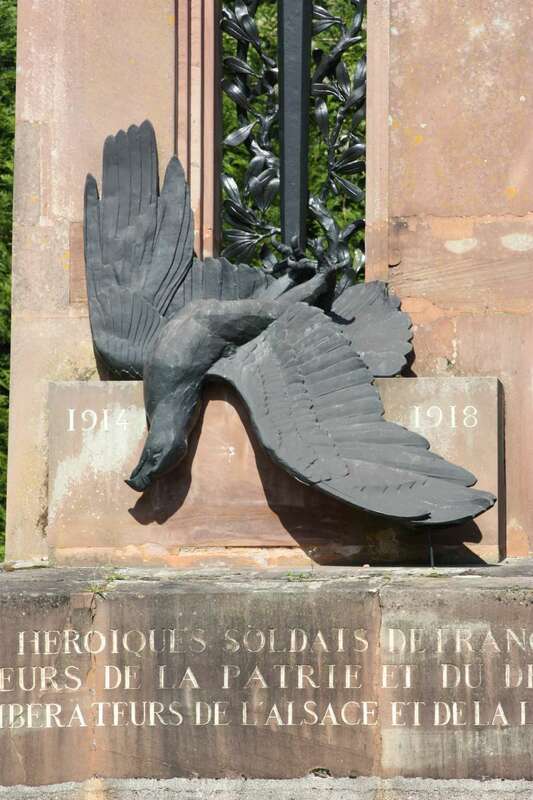 First you see the heavily symbolic and massive Alsace Lorraine Monument -- a huge sculpture depicting a sword cutting down the Imperial Eagle of Germany. Park in a small car park and walk along a wooded path and you're in an extraordinary clearing. In front of you railway tracks lead to the centre of the memorial, tracks that were used to bring two railway carriages here in 1918. To one side there’s a statue of Marshal Foch and ahead, between a tank and a gun, stands a nondescript, low, white building with flags on the front, looking rather like a school. The little, unassuming building you see houses the Armistice Museum. It was renovated in time for 2018. Here you'll see a replica of a railway carriage which looks like the genuine thing. The original carriage was where Marshal Foch and his officers, who included the English First Lord of the Admiralty, Sir Rosslyn Wemyss, and the French Chief of Staff, General Weygand -- met with the Germans to sign the Armistice to end the horror that was World War I. The Armistice was signed on November 11th at 11pm. After the carriage you come to another section covering World War I. Yellowing newspaper articles, photocopies, old cameras showing you pictures from the various fronts, flags, objects made from shells, old, hypnotic film footage and more are immensely evocative of World War I. There are American artefacts here as well, including copies of newspapers from Raleigh, Virginia which sent considerable numbers of American soldiers, describing the progress of the war. It’s the very simplicity of the display and the objects that is so affecting and draws you as a visitor into those events of the past. The second space covers the events of 1940 which to the French was a very different story. The Battle of France was lost; the enemy was in Paris and France was about to be cut in half. A request for an armistice was made, and here in the forest at what was called the Glade of the Armistice, the French and German delegations met on June 21st, 1940. Talks were conducted in the very railway carriage that had been the scene of Germany’s defeat then the Armistice was agreed –- a deliberate and highly effective venue for the French humiliation. During the German occupation of France, from 1940 to 1944, the site was cleared and the carriage taken to Berlin. Later as the war went badly for Germany, it was moved to the forest of Thuringe and destroyed by fire in April 1945 by a country fearful of a repeat of the 1918 Armistice negotiation and signing. This wasn't the end of the story for the forest clearing known as the Glade of the Armistice. On September 1st, 1944, Compiègne was liberated. In November, General Marie-Pierre Koenig, the best known Free French leader after General de Gaulle, led a military parade in the Glade watched by crowds that included British, American and Polish officials. On November 11th, 1950, a replica railway carriage was officially opened containing the objects that you see today. When you leave, there is one more quiet corner you should visit. Off the main road back towards Compiègne, there's a signposted forest path that takes you to a gravestone. It marks the spot of the last train from Compiègne to Buchenwald on August 17th, 1944, carrying 1,250 men to the death camp. To get there: Leave Compiègne to the east on N 31. At the Aumont roundabout, contine on D546 to the Francport roundabout and the car park. Compiègne is an interesting town to visit with a palace built by Napoleon which stretches over several buildings and includes a car museum. It's less well known than many French towns and has a delightful local feel to it and some decent hotels and restaurants.